Professional bulk eraser and Degausser for tape, and electronic media. The CDS-105 Dataraser provides 100% erasure on all types of data reels, data cartridges, diskettes and audio tapes. Proprietary information is quickly and easily erased before reusing or disposing of media. 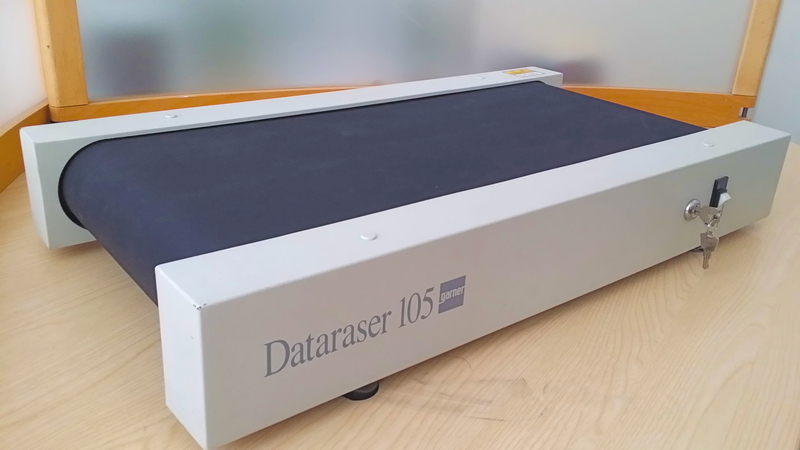 Once degaussed on the Dataraser 105, the data is destroyed and cannot be recovered. 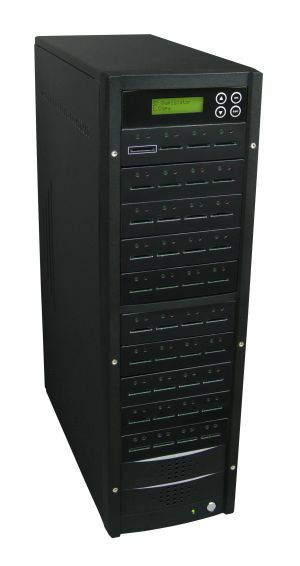 The CDS-105 Dataraser allows data processors to completely erase media, providing confidence that old, unwanted data will not affect new data storage. 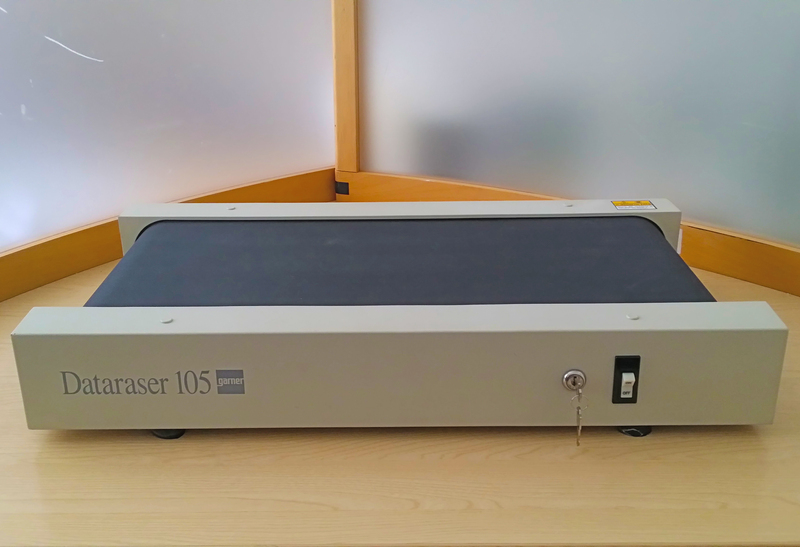 Audio tape users rely on the CDS-105 Dataraser to erase old programs prior to re-recording. Degaussing assures new recordings are not contaminated by prior signals. Conveyor Speed: Four inches per second. Method of Operation: Magnetic material is carried on a continuous conveyor belt over high-flux coils and are deposited at the end of the machine. Thermal Protection: Overheating is prevented by automatic cutoff switch, which reactivates after cool-down period. 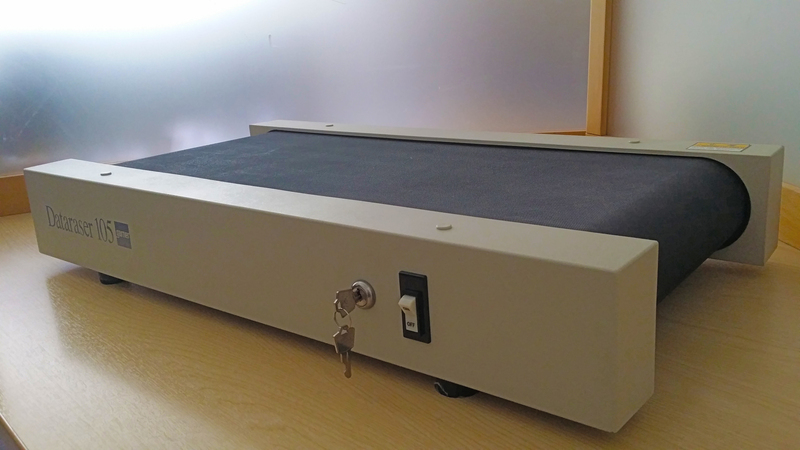 Optional Magnetic Field Cover: Prevents operator from removing media before it reaches the end of the conveyor to ensure complete erasure.